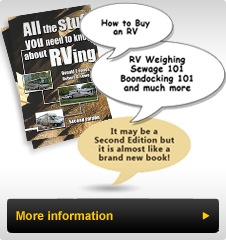 Notes And Updates: Furnaces in present day RV's are equipped with sealed Limit switches. There is no need to update them, simply replace if defective. We no longer carry replacement furnace circuit boards. Reliability has greatly improved and most issues relating to the operation of a RV Gas Furnace relate to items other than the circuit boards. Check out some of our other TechTips for useful hints on how to reduce furnace malfunctions. The Fall BOA Rally is a Technical Rally and those of you that attended found out a lot about various components of your Bounder. In the next few articles I will highlight some of these sessions and pass along a few hints that I picked up. This seminar was one of the most practical sessions of the Rally. Mr. Jim Spainhower, from Suburban gave the sequence of power flow through the furnace: It is Power Switch, Thermostat, Sail Switch, Relay, Limit Switch and then the Circuit Board. If the power switch, located at the bottom of the thermostat, is on and the temperature is below that set on the thermostat, then the blower should start. When there is sufficient airflow the sail switch will close and the relay will send power to the limit switch (which turns off the propane in an overheat situation) and then to the circuit board. The circuit board sends power to the gas valve to open the flow of propane while concurrently sending power to the ignitor to provide the spark ignition. The furnace requires at least 10.5 volts of power and 11" of water column gas pressure. Intake and exhaust screens should not be used while the furnace is operating. The tiny wires of the screen reduce combustion efficiency and raise the possibility of carbon monoxide being formed. He stated that no insect "with any brains" will enter the furnace while it is operating and that if you must use a screen, install it when the vehicle is stored for a length of time without using the furnace. Most newer Bounders have the furnace mounted below the floor, which makes the limit switch inaccessible from inside of the rig. All components are accessible by removing the four painted screws from the outer access cover, disconnecting the gas line (after closing the propane tank valve) and removing one retaining screw. This allows the furnace assembly to be removed for service. The limit switch is an open, bimetal design and it can and does get sediment in it that can prevent it from closing, therefore the furnace will not light. Just jiggling the switch or furnace often will dislodge the sediment and allow normal furnace operation. The large front furnace (35,000BTU) must have four unobstructed air ducts in the living area and the smaller rear furnace (20,000BTU) requires two unobstructed air ducts in the living area. Each furnace will supply air to the respective storage areas and they will typically be 22 degrees cooler than the living area. Thus to keep water tanks from freezing he suggested a minimum temperature 60 degrees to compensate for air temperature fluctuation. He suggested that the circuit board is the last item to be changed if a furnace will not light. Many perfectly operational boards are replaced because someone did not go through the sequence shown above to check out the furnace. To Clean the Dometic Refrigerator burner tube: Use a plastic drink straw to blow air into the burner tube so that rust particles are blown out of the burner six flame holes. Proper Air Shutter Adjustment on the Atwood Water Heater: * of the burner air holes should be open, providing a light blue flame with just a tip of yellow. This will reduce the roar when operating If your Kwikee Step does not always retract when you start your rig, Fleetwood has a relay that can be installed to correct the situation. This may be particularly noticeable on a Ford Chassis since there is the position between "On" and "Start" on Ford's where there may be a microsecond with no power to the step, and the step will go into the lockout mode and not retract. This problem is a minor design flaw in the electrical system and it is corrected with the relay fix.